The summer is here and many people will be going on holiday over the coming weeks. Taking a CPAP machine with you can raise a few questions however - so here is some useful information to note if you're jetting off soon. Do I need an adapter plug for mains power? Most CPAP machines use a figure-8 mains lead (right), and can accept any voltage between 100-240V. This means you can use your machine virtually anywhere in the world, and all you need is the appropriate figure-8 lead. Using a cable rather than a converter reduces the risk of any damage being caused to your machine. CPAP.co.uk has plugs available for the UK, Ireland, USA, Canada and Europe here. If you are unsure what plug the country you are travelling us, then you can find out here. However if your machine has a fixed power lead (ie, it cannot be removed from the machine) then a travel adapter will be required. Can my machine use a battery? Most CPAP machines can run from a 12V source such as a battery, you'll just need the appropriate 12V cable for your particular model. Check the back or bottom of your CPAP machine to find the electrical requirements and see if 12V (or 24V) DC is listed - if so, then you should be able to find an appropriate lead and battery. If you have a Philips machine, you can get the DC cable here, and DeVilbiss SleepCube users can find theirs here. If using a ResMed machine, you'll need to contact ResMed directly. You can then use a 12V battery with a cigarette lighter output, such as the Tracer 12V Compact CPAP Battery. This is ideal for a night or two away from mains power, or for use on a flight (its 96Wh capacity is just below the 100Wh limit most airlines use - so you can get maximum running time on your flight). Can I take my humidifier? CPAP humidifiers can be transported, but it is often better to leave them behind. They're heavy and bulky, they have to have mains power (they use too much power for a battery or other 12V option), and even the smallest amount of water left inside can find its way into the main unit and damage it. You may instead want to consider a low-cost Waterless Humidifier for short-term use while travelling, but otherwise unless the humidification is essential to you many find it better to go without for a short period. Do travel CPAP machines exist? Yes. 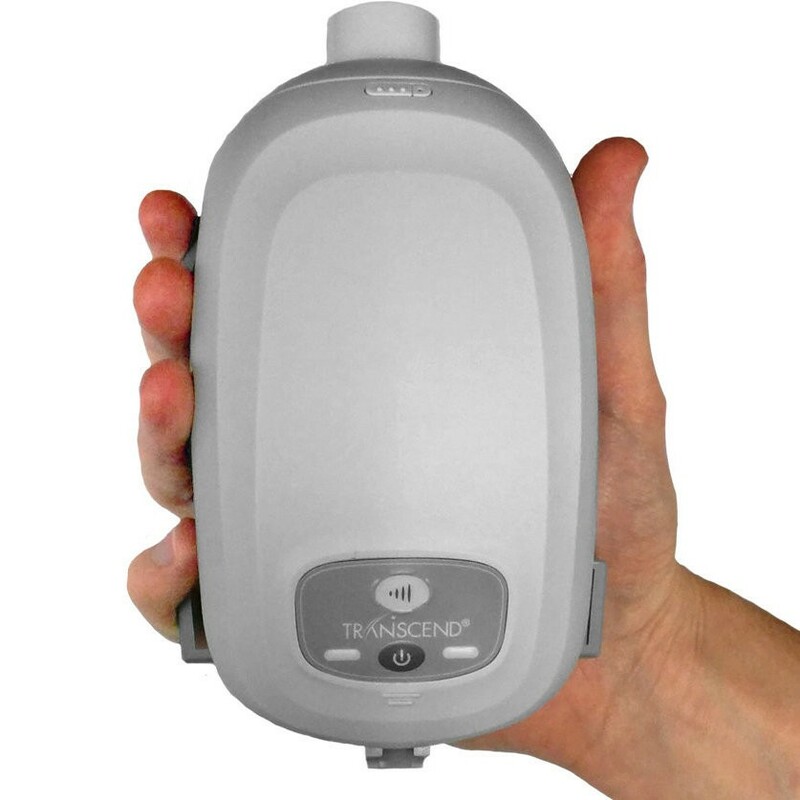 A machine such as a Transcend makes travelling with CPAP far easier, as they're a fraction of the size and weight of regular machines. They also have their own battery options if desired, which are in turn smaller than those used by regular machines. They do come at a cost, but for many the convenience and portability they offer make them a sound investment. You can find out more about the Transcend machines on our dedicated website, MiniCPAP.co.uk. If you wanted to purchase a travel machine but have not got anything in writing confirming you use CPAP, then you can ask your GP, consultant or sleep clinic to complete this short form which will then allow you to. Can I take my machine on a flight? Generally speaking, yes - but always check with your airline, and if they give approval then request it in writing. Several airlines will allow it as additional carry-on luggage, meaning you do not need to sacrifice space in your cabin bag. You may also need to have something in writing from your doctor or sleep clinic confirming your requirement for it - we would recommend asking for that right away because there's often a wait for that to be issued. Can I go without CPAP while I am on holiday? Using CPAP is a little like drinking water. You can drink water every day for weeks - but they day you stop, you'll get dehydrated. CPAP has a similar effect on sleep quality - the night you stop using it, OSA will disrupt your sleep. So it is not advisable to go without - after all, a holiday is about relaxing and enjoying yourself, and it is difficult to do that with poor sleep. So it is worth seeing if there is a solution to your CPAP travelling problems. If you really cannot take the machine with you, then using a Mandibular Advancement Device (which is akin to a gumshield) such as a SomnoFit will provide a degree of treatment for a short period. However for those diagnosed with Severe, or even Moderate, OSA then this is unlikely to be sufficient so why not give us a call or an email, and we will see if we can find a solution with you that will allow you to continue the benefits of CPAP while you are away. If you have a holiday coming up and have a question or two not answered here, why not leave a comment for us or other readers to help you?